There were many things I came to love during my nearly five year stint in New Haven, Connecticut. The blooming cherry blossoms in the Spring, the local restaurants (you won’t find a chain restaurant anywhere in the city limits), the outdoor life once Winter decided it was time to go, and then there was the pizza. Oh, my, I never knew pie could taste so good. The thin crust baked just right in a wood fired oven, well, it’s kiss your mama delicious. 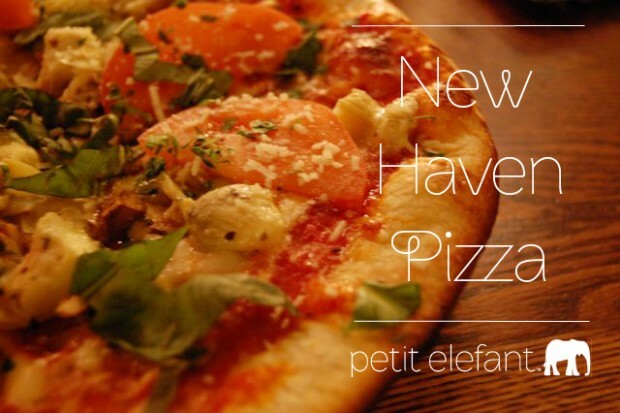 Check out my opinion of the three best New Haven pizza eats and a recipe for a one-of-a-kind pie! 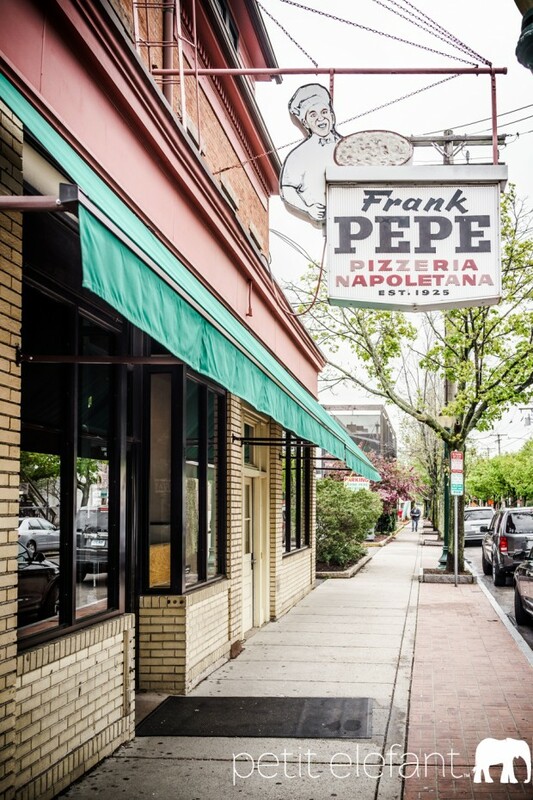 If you want a good eat AND a chance to dine in the same seats as past Presidents, then Pepe’s is your place. The chances of having to stand outside in a queue waiting to be seated are quite high, but they are pretty fast and the pizza is worth it. The name just rolls off your tongue like you’re really Italian which should indicate the authenticity of this dive. The traditional pizzas (like pepperoni and cheese) are to die for. When we wanted to grab a quick dinner to bring to a friend’s house, this was our go-to place. This is the kind of pizza that you toss on the table, open the lid, and it’s gone before you realize it. No plates needed. Yes, that’s the name of the place, and yes, it is a bar. Our kids were young when we lived in New Haven. When I think about the fact that we used to take our toddlers there for pizza, I’m reminded of Sweet Home Alabama when Melanie (played by Reese Witherspoon) tells her friend, “You have a baby! In a bar!” Don’t worry. We would go when it was still light out and no crazy bar shenanigans were going on. You see, though, it was the only place we knew of to get mashed potato pizza. If you just did a double take, I don’t blame you. I was quite sure that this carb overload would be subpar. Quite the opposite. It’s delicious. In fact, because these crazy parents took their babies [to a bar], we were inspired to learn to make mashed potato pizza ourselves (which came in really handy when we moved). Your thighs might not appreciate you, but just keep it a secret from them, and it will be fine. Recipe below! Boil potatoes and garlic in chicken broth. Add water, if necessary, to cover potatoes. Boil 20-30 minutes or until potatoes are soft. Add some cream, salt, and pepper to your desired taste and consistency. Mash or whip until creamy. Top with mashed potatoes, cheese, chives, and bacon. 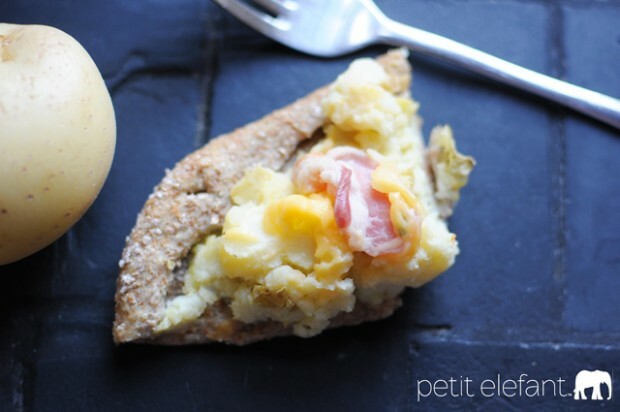 Bake until crust is golden and cheese is bubbly. *These potatoes are enough for 2 pizzas! Oh, I was hoping this would be a recipe for a mashed potato crust… This does sound like a great place to find pizza! Oops! Sorry to disappoint, MaryAnne! That would be a good crust, though! Same here, I was thinking it would be a gluten-free crust. I’ve never had mash as a pizza topping. Intriguing! I like sausage and green pepper pizza, or olive oil and mozzarella without tomato sauce. It is a strange pizza topping. I never thought I would like it until I tried it!